On the road again, this time for the long drive from Jaipur to Agra – the site of the splendiferous Taj Mahal. On travel days like this one, the stops are less frequent and are mostly out of necessity for bathroom breaks and food. 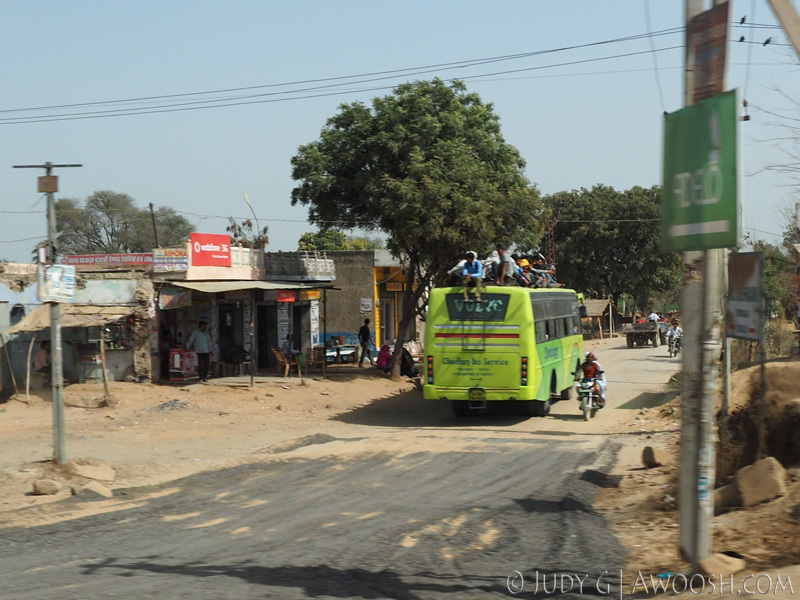 On the alternate days, when we are touring cities and sites, we are artfully dropped at ground zero for a couple of hours, into the thick of India, – basically until we reach the saturation point, then back on the bus (which I affectionately called ‘the bubble’), to regroup, recover, and relocate to the next stop. 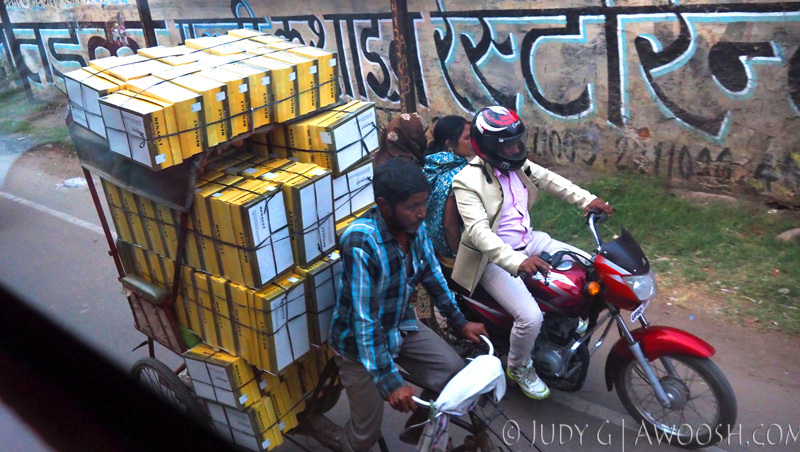 Being in the bubble allowed us to witness life in India, without being assaulted by it. Off the bus, on the ground, India is in your face – the masses of people, the sounds (generally cacophonous), the smells – which fortunately were generally not offensive on our trip, as we were in India in the cool, dry season (November to March in Northern India), when there was not too much heat, nor humidity, which would otherwise slow cook the garbage, urine and faeces that are everywhere. But there was still the ubiquitous need to skirt around many land mines of cowsh*t whilst on foot, as well as regularly run the gauntlet of super persistent vendors, and beggars, who opportunistically converge at the busiest touristy areas. Time on the bus is spent gazing out the windows at the flyby scenery, chatting with other passengers, and, for some folks, dozing. Personally, I am not a great sleeper in moving vehicles (likely due to a deep-seated discomfort that someone else has my life in their hands ;^). As for the people on the tour? We numbered 31 – which in my opinion is really too large a group for a tour in India. How Bonnie managed to keep us wrangled in some of the very crowded venues and streets was pretty much miraculous, and it’s a testament to her amazing organizational skills. SmarTours apparently did not had enough people to run the previous tour, so had carried those people forward into ours, which made for a bit of an unwieldy crowd. Hindsight is always 20/20 – and this was a question that we should have asked at time of booking – that is, what is the anticipated/maximum size of the group that would be going? I think it was a mistake for SmarTours to book this many people, as the quality of the trip was for sure going to be compromised, and it makes the job much trickier for guides like Bonnie – who rely on tips as a large part of their remuneration. Overcrowding any trip no doubt negatively affects the satisfaction, and therefore the amount tipped, as well as the level of recommendation to others, for the majority of passengers. Most of our large group were Americans and Canadians, but we also had a Polish couple and a Brit in the gang. The preponderance of North Americans is likely because SmarTours is also based there. We saw many other tours, from many countries, conducted in many languages, doing basically the same gig as ours. Our group was comprised of generally very nice folks, but there were a few people who grated, especially after 17 days in close quarters – most especially a couple of ladies that we coined Tbe Debbie Downers (plus the renegade farter who apparently had no qualms about regularly crop dusting the back of the bus where we were seated). Check out the number of roof riders on the green bus! Crazy! 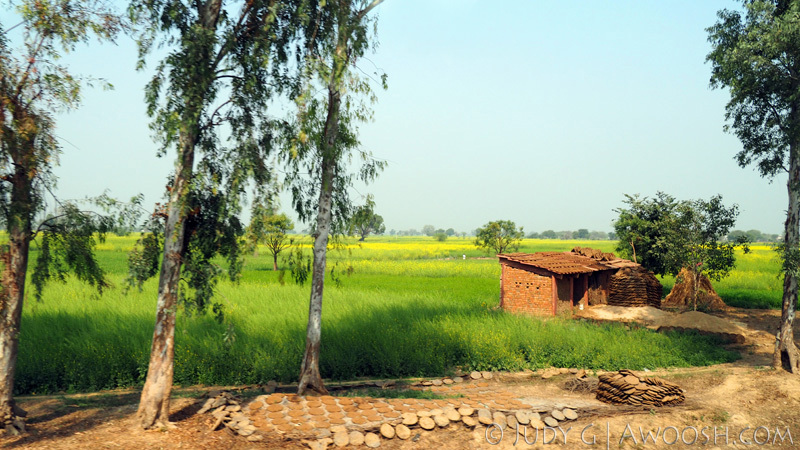 Country living in India. 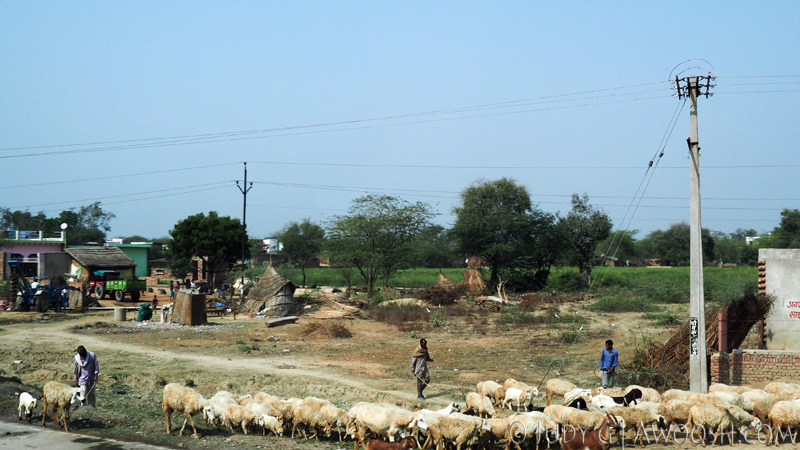 In the foreground you can see the discs of cow poo drying in the sun, and stacks of it to the side. The Indians use these as cooking fire fuel. A big herd of sheep, being, er, herded. 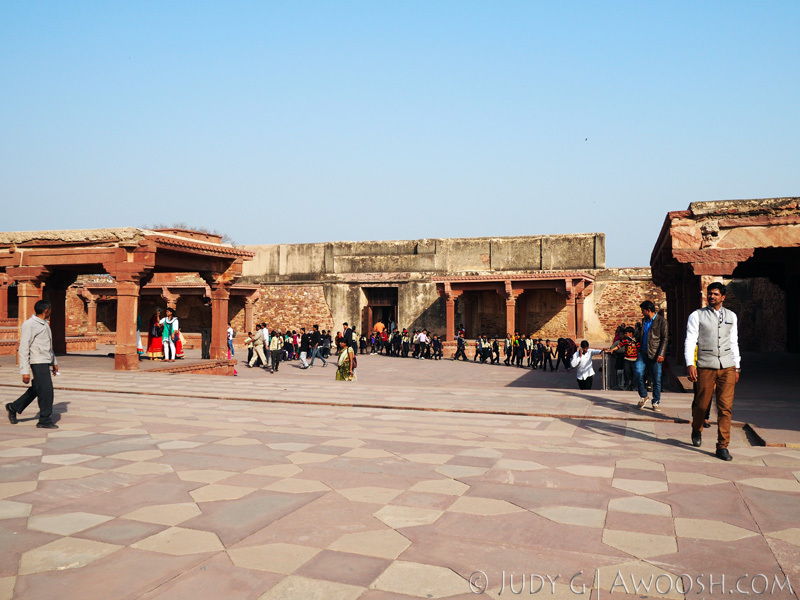 Other than the aforementioned stops to use bathroom facilities and grab some snacks, there was only one cultural tour this traveling day, at Fatepur Sikri, a large, ancient, walled city located not far from Delhi. 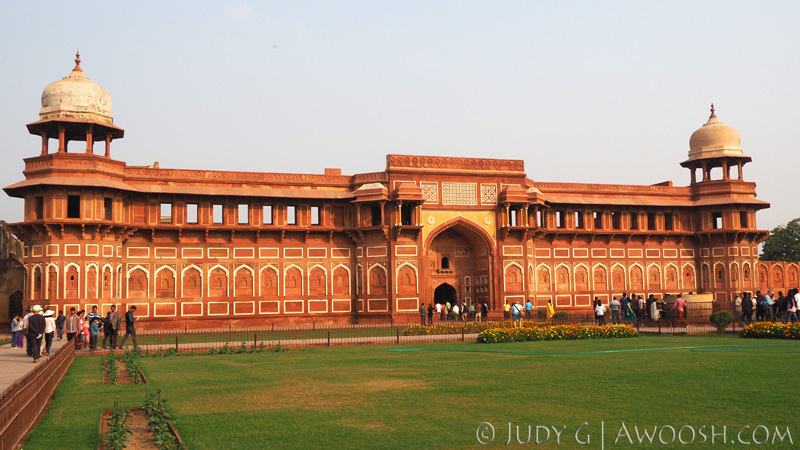 This amazing complex was completed in 1569, under the leadership of Emporer Akbar, of the Mughal Empire. The Mughals (also know as Moguls) were descendants of Genghis Khan, who invaded India in the early 1500’s. It was a mostly peaceful occupation, and the Mughals, although taking control of most of India, permitted the Hindus to carry on with their lives, and worship their own deities. 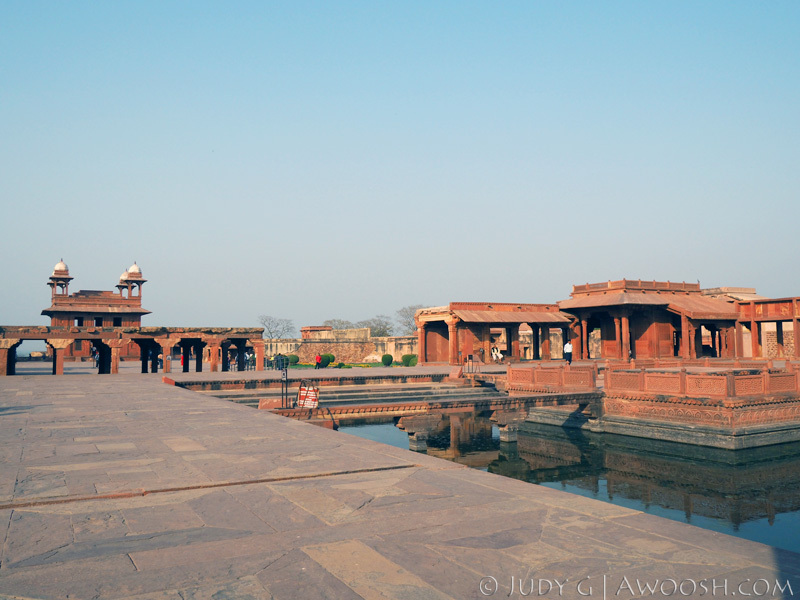 Fatepur Sikri stood as the capital of the empire from 1571 until 1585, when it was abandoned due to chronic water shortage. Oops on building a city without the assurance of adequate water supply. 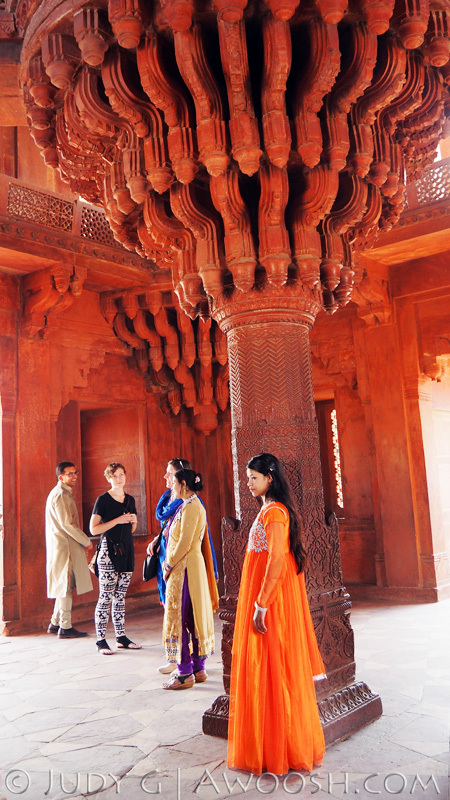 Red sandstone is native to this part of India, and the structures of the Fatepur Sikri are all constructed of it, making for very rich, beautiful architecture that appears to have several cultural influences. It was a clear, sunny day when we visited, but not very hot. 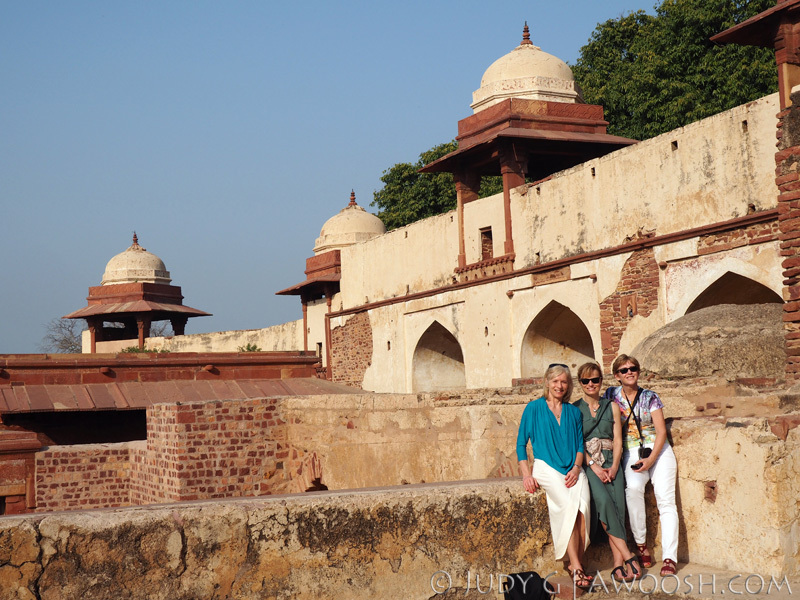 I can’t imagine touring this site when the temperatures are in the high 30’s (as happens seasonally in India) – it would become one big, red, scorching brick oven! A panoramic photo of the palace courtyard. A very ornate pillar in the centre of Diwan-i-khas. After this stop, we were back on the bus for the final leg of the journey to Agra. As we drove into the outskirts of the city at dusk, we were saddened to see some really dire living conditions for its citizens (current official population 1.6 million, but probably quite a bit higher than that with so many homeless people). Agra, where the beloved Taj Mahal is located, is a major tourist mecca – and not just for foreign tourists, but many many Indian tourists also make the pilgrimage to see this amazing monument to love. The revenues must be astounding – everyone pays entrance fees – although the prices are adjusted so that foreign tourists pay quite a bit more than Indians. 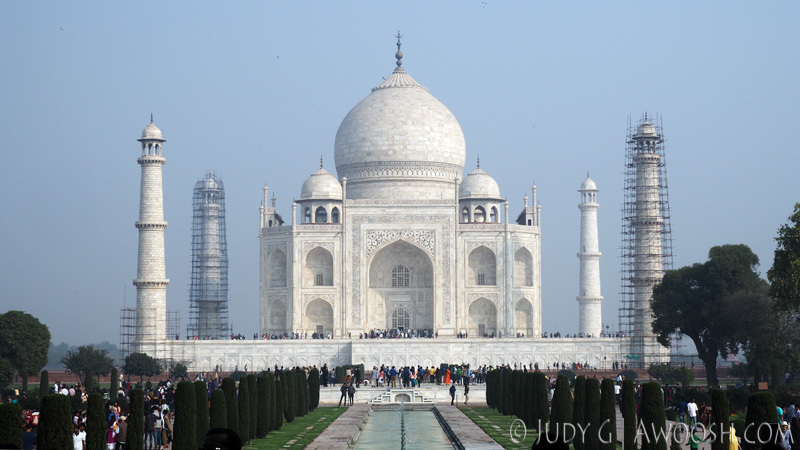 On the day we visited the Taj, our guide estimated that there were about 30,000 people on site. On a busy day, we were told that as many as 125,000 people may visit. Cha-ching! 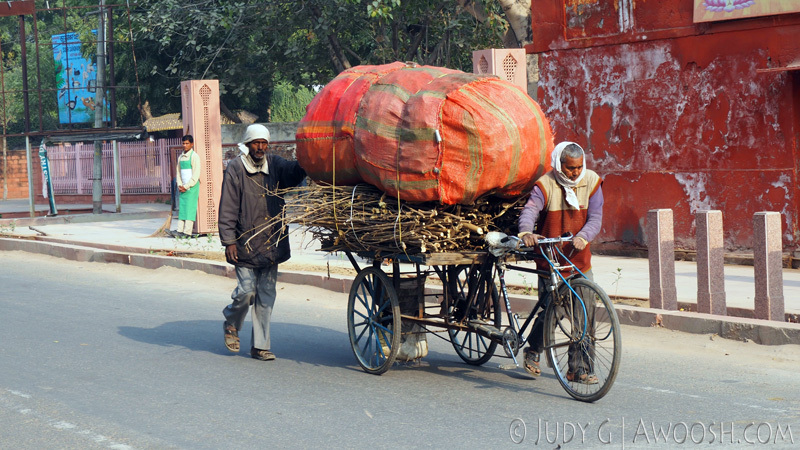 Unfortunately, it does appear that not much of this colossal revenue is trickling down to the citizens of Agra. 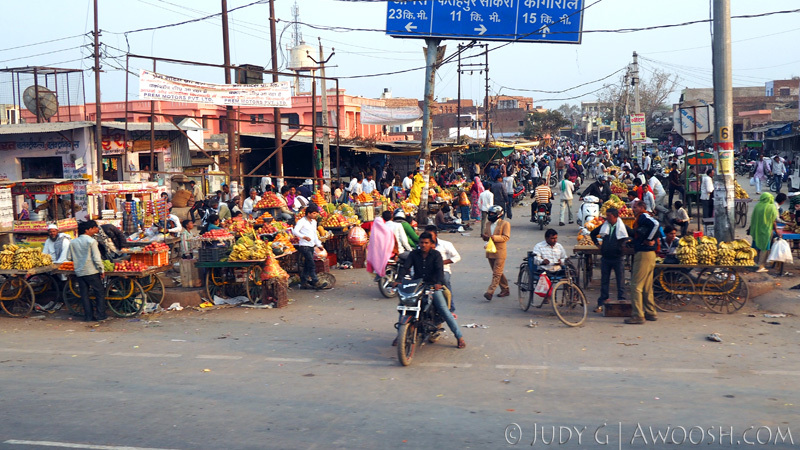 Market town outside of Agra. Gandhi’s Glasses. 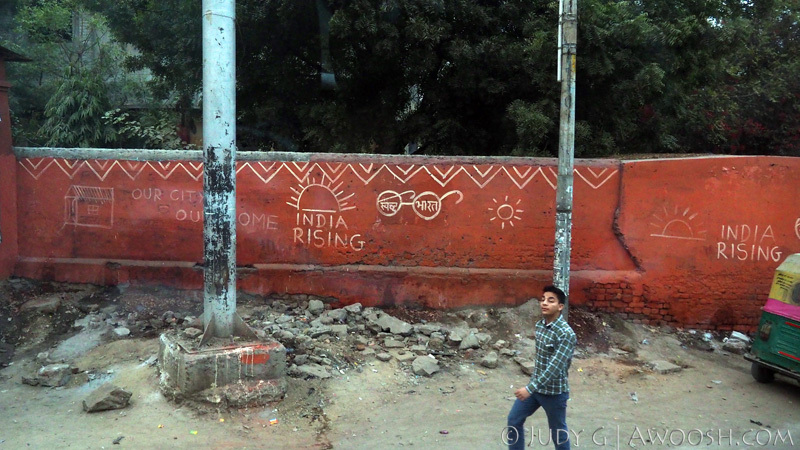 I believe ‘India Rising’ is a movement aimed at social justice in India. A heavy load. 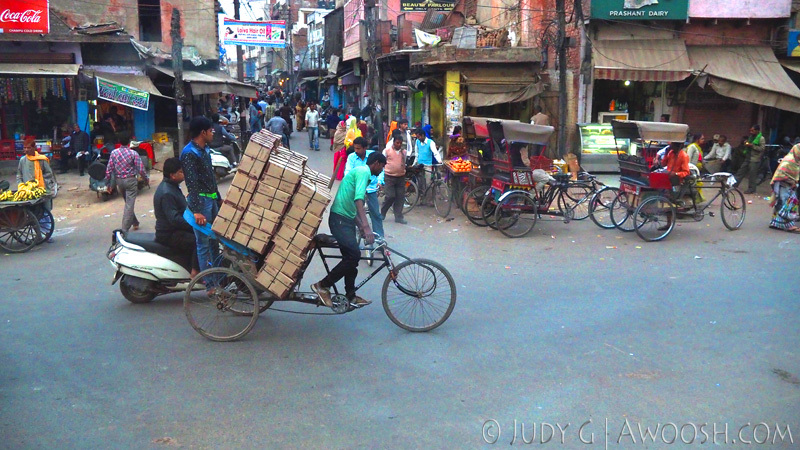 Bicycles are commonly used in India to move loads of stuff around. 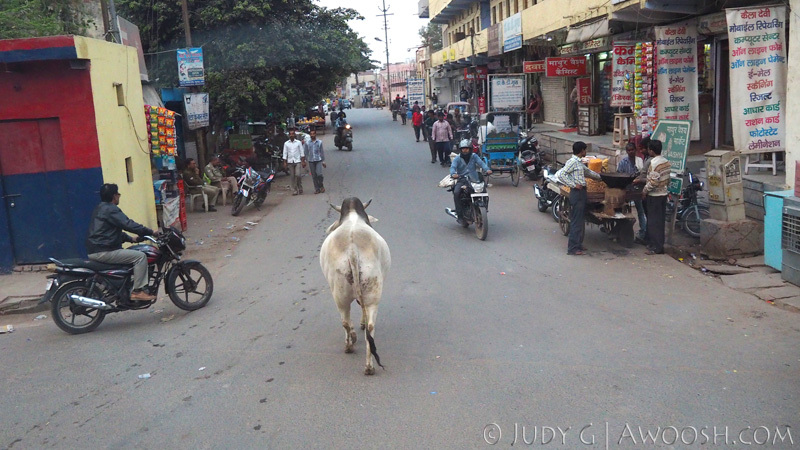 Cows roam freely in cities like Agra. We were told that they are all owned by someone. The cows are released in the morning, after milking, to wander the streets and forage for food – sadly, mostly garbage. At dusk, they wind their way home to their owners. It’s on the bucket list for many people, myself included. And it is as amazing as the hype – a huge, glowing, white marble testament to love. The main attraction of this UNESCO World Heritage site is the mausoleum itself. 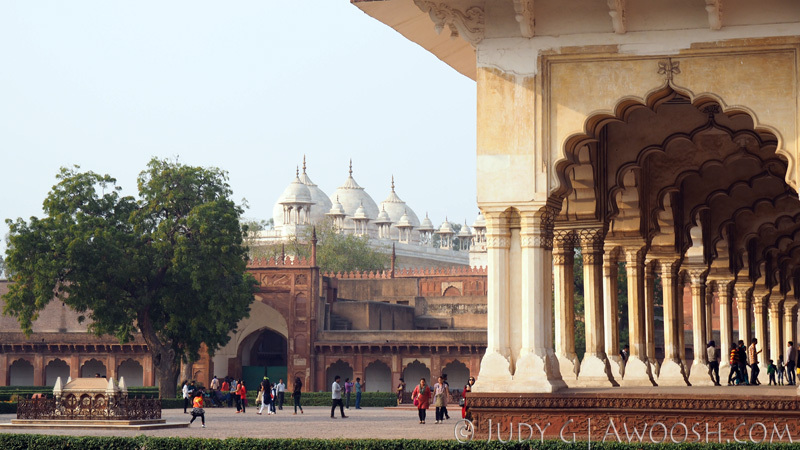 Commissioned by Shah Jahan, it took just over ten years to be built, and was completed in 1643. Thousands of skilled artisans were employed by the Shah to construct and decorate this tomb for his favourite wife (like all Mughal shahs, he had many). The cost, even in those days, was staggering – estimated to be about US$850 million in today’s values. That is some kind of big love :^) This particular wife, Mumtaz Mahal, died while birthing their fourteenth child. Tombs for his other wives are located nearby, but outside of the main Taj Mahal complex. In the end, the shah’s body was also entombed in the Taj. Both he and his beloved are still there. 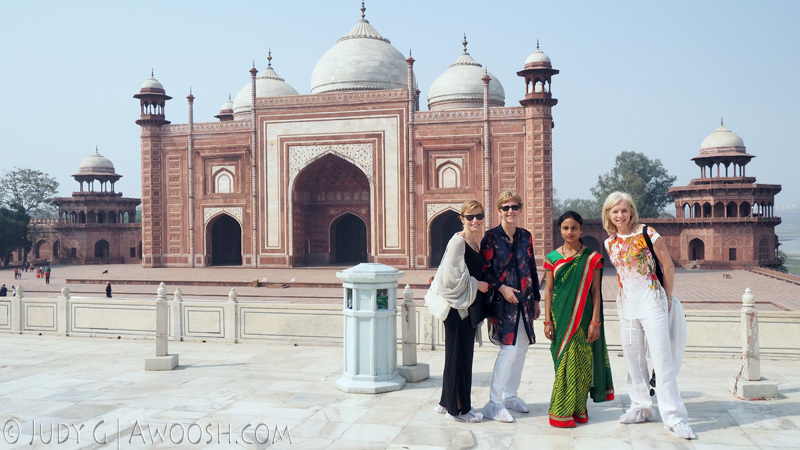 I hadn’t realized, until we arrived in Agra, just how huge the entire site is. Not only is there the Taj Mahal (the beautiful white building with the massive dome atop) and its four minarets, but there are two huge structures flanking it – all connected by a massive terrace. One of the flanking buildings is an (active) mosque, while the other, its twin, is called ‘the answer’. Its purpose is not entirely clear, but some believe it was a guest house. At the very least, it created pleasing architectural balance and grandeur. 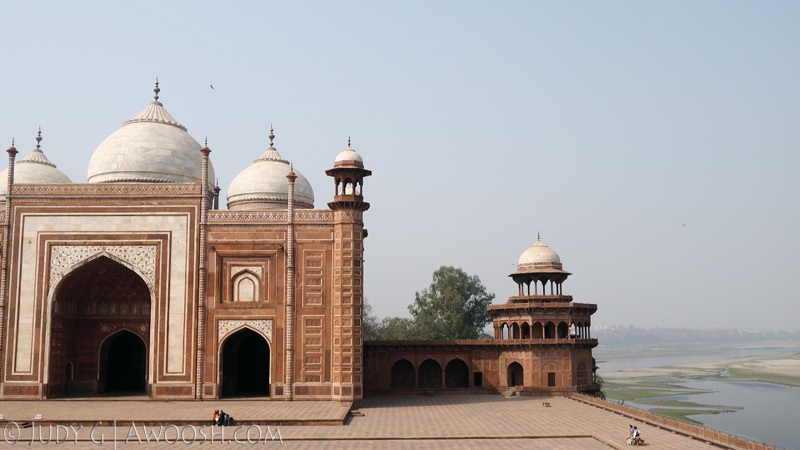 There is also another very large structure that is the gateway to the site, which resembles other classical Mughal structures that we saw in India. And then there are the beautiful, formal gardens and their water features, which run between the main entry gate and the Taj plaza at the far end. The gardens are reminiscent of other classical European gardens that I have visited, except here they have wild monkeys living in them! On the far side of the Taj Mahal plaza is the river Yamuna – a tributary of the Ganges – the sacred river of India. I’ll be sharing more about this famous and mysterious river when I get to the chapter on Varanasi. The marble that was used to build the Taj Mahal is quite unique – unlike most marble, this stone, which was quarried several hundred kilometres away and carted over by elephants, is non-porous, and therefore does not stain or weather easily. 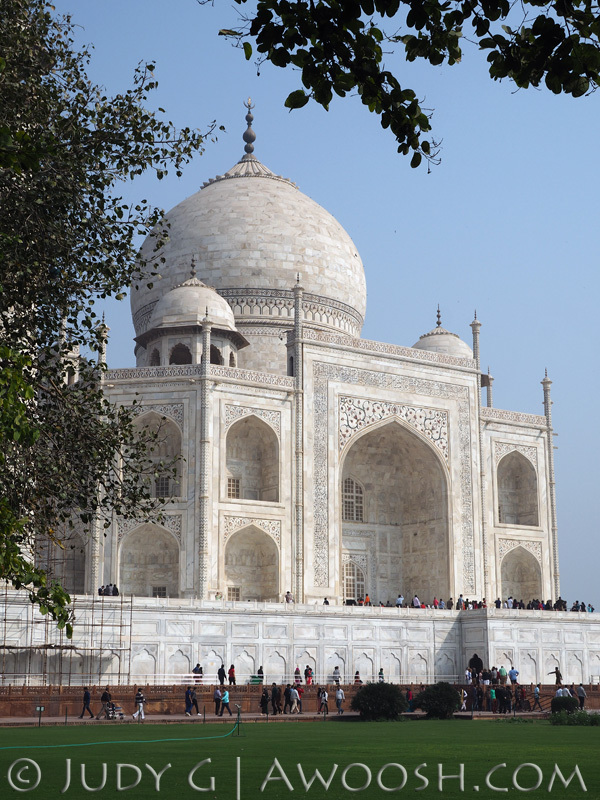 So this amazing structure really is quite pure white, despite the centuries – so much so that it actually glows in sunlight and seems unblemished by the air pollution that is generally pretty heavy in India. The four minarets, which are used in the Muslim faith by the muezzins to call the devoted to worship, were cleverly designed – each with an ever so slight lean outwards, so that should they collapse, they would fall away from the Taj Mahal, instead of onto it. 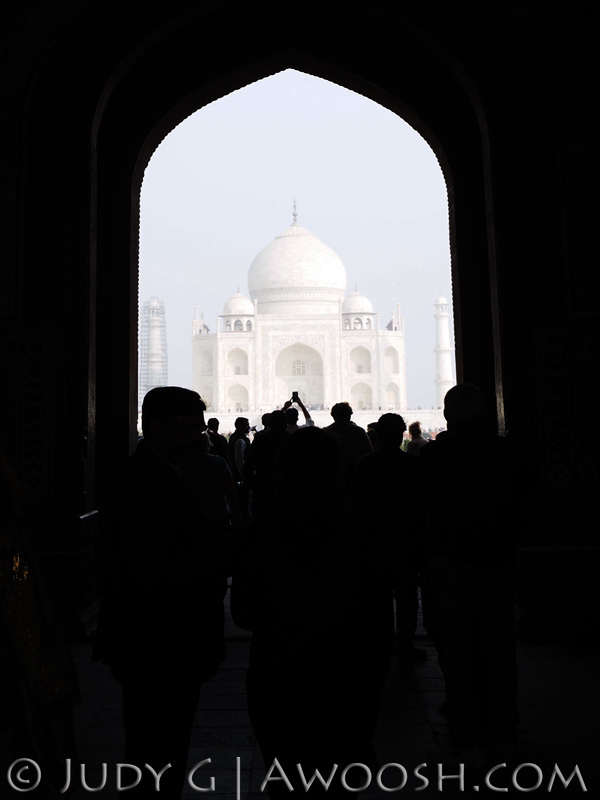 The Taj at first sght, through the archway of the entry building. Getting closer. A shot from the garden. From here, you can see some of the decoration of the building. Talented artisans inlaid precious and semi-precious jewels all over the thing. You can also get a sense of the scale of the Taj by seeing the puny size of people adjacent. It is massive! The (active) mosque to the left of the Taj Mahal, as you are facing it from the entry. 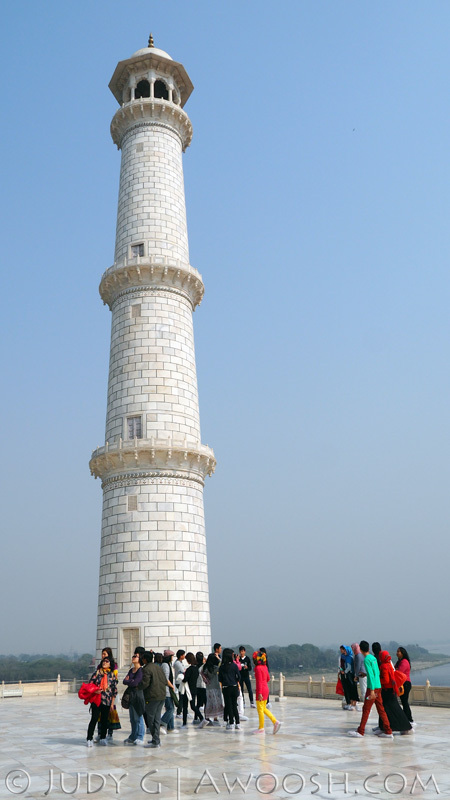 One of the four, very tall minarets. As I wrote above, tney all lean away equally from the actual mausoleum. The mosque (in many ways quite similar to the Jama Masjid that we visited in Delhi), with a view to the river beyond it. You can’t really see it through the haze in this photo, but the Agra Red Fort is in the distance, about a mile away. 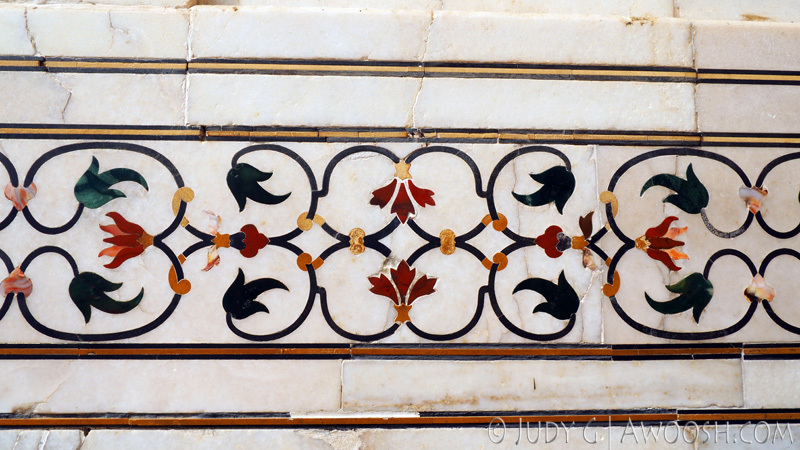 Some of the beautiful and ornate, inlaid decoration on the exterior of the Taj Mahal. The interior was very dark when we entered – no lights in there, and flash photography was not permitted, but there is apparently some beautiful carved marble and more of this intricate artwork in there as well. 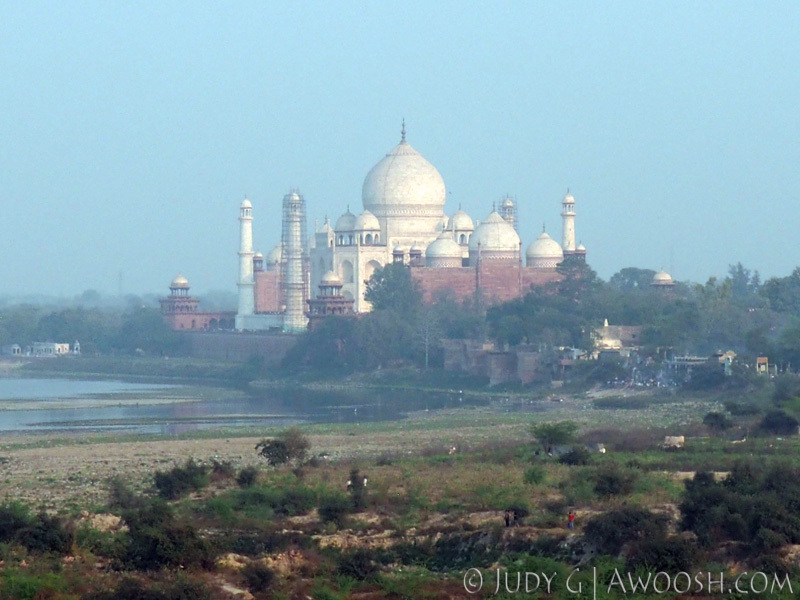 A panoramic photo of the Taj Mahal, with the active mosque to the left, and ‘the answer’ to the right. After the Taj, we stopped for a nice lunch, and then had a visit to an Agra artisan centre, where we were shown a short and informative film about the history, unique to this area, of ornate stone inlay. And of course, afterwards, we were funnelled through a showroom where folks could buy some of this beautiful art, to take with them or be shipped home. 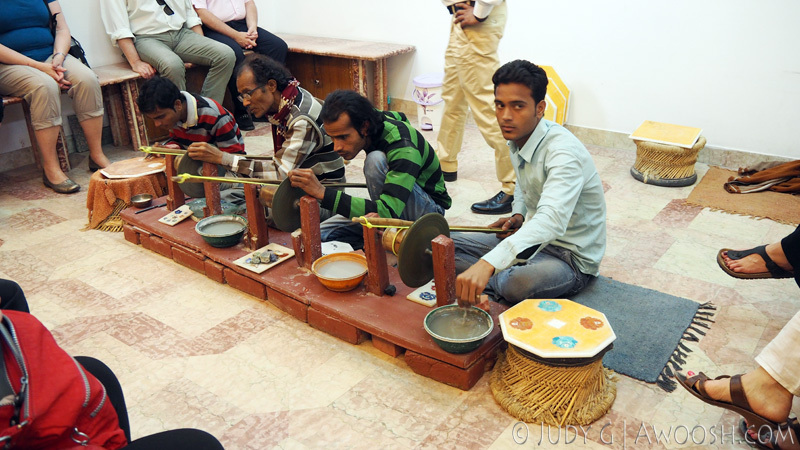 Artists demonstrating the art of stone inlay. 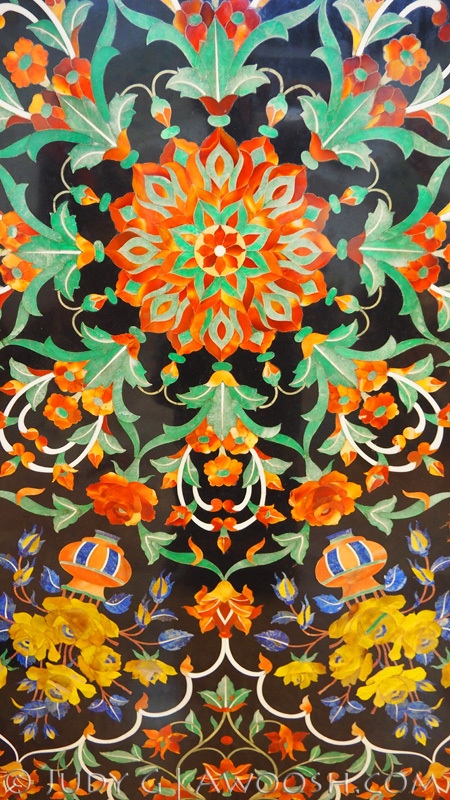 This is a gorgeous stone tabletop, of black marble with stone inlay. Well, if that wasn’t enough of an awesome day, our final stop in Agra was at another huge UNESCO World Heritage site – this time the Red Fort in Agra. This place was enormous, covering many square kilometres – of which we had the opportunity to tour just a small portion. There is a lot of history on this site, including lots of violence, and fortifications were there as early as the 1000’s. Much of the walled city was constructed in the sixteenth century, by the ever-industrious Mughals, done in the red sandstone which is native to this part of India. However, the same shah (Jahan) who was behind the construction of the Taj Mahal, and who clearly favoured white marble, also had buildings constructed during his tenure. In the end, he was locked up by one of his sons, who aspired to remove him from power. 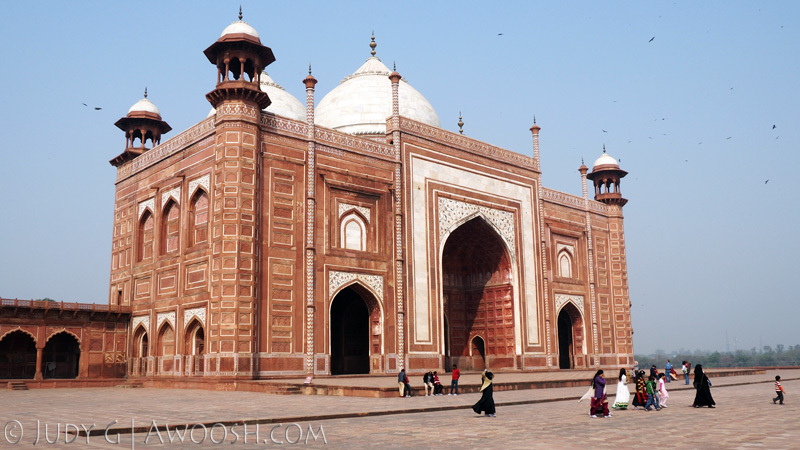 Rumour has it that he died in a structure inside the fort that shared the same view of his beloved Taj Mahal that I featured in the opening image of this chapter. This was another very busy tourist site, at the end of another busy day. So once again I paid less attention than I should have to the historical details of what we were seeing (figuring I could read about it later), and instead wandered around with my camera to try to capture some of the grandeur. A main gate to the walled city. The Hall of Public Audience (Diwan I Am), to the right. 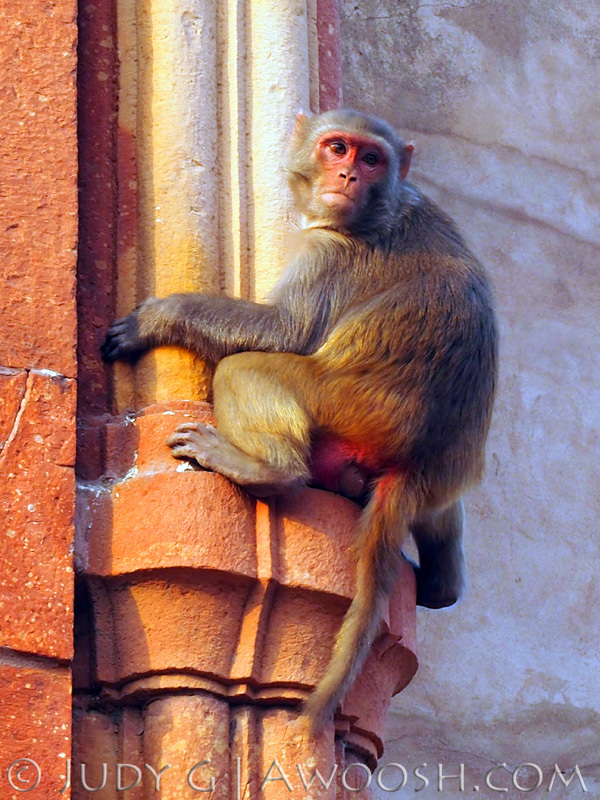 A red-bummed monkey, climbing on one of the archways. Well, that is a wrap of the Golden Triangle. Next stop is Khajuraho, and the racy Kama Sutra carved temples. To get there, we’ll be riding our first (and only) Indian train. And we’ll also be going on safari, and looking for tigers. 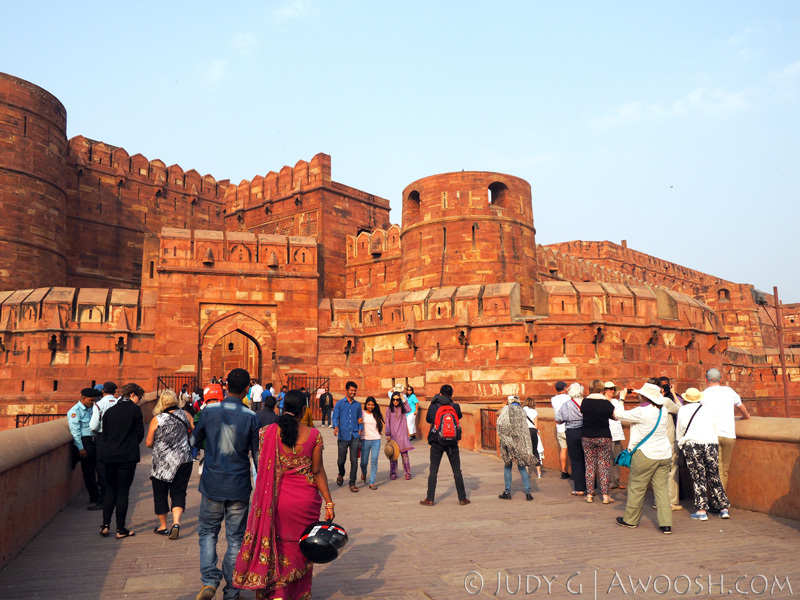 This entry was posted in Photography, Travel, Trip Reports and tagged Agra, Agra Fort, Bonnie Backer, Bus tours in India, Fatepur Sikri, SmarTours, Taj Mahal. Bookmark the permalink.